This is what I have been up to lately. 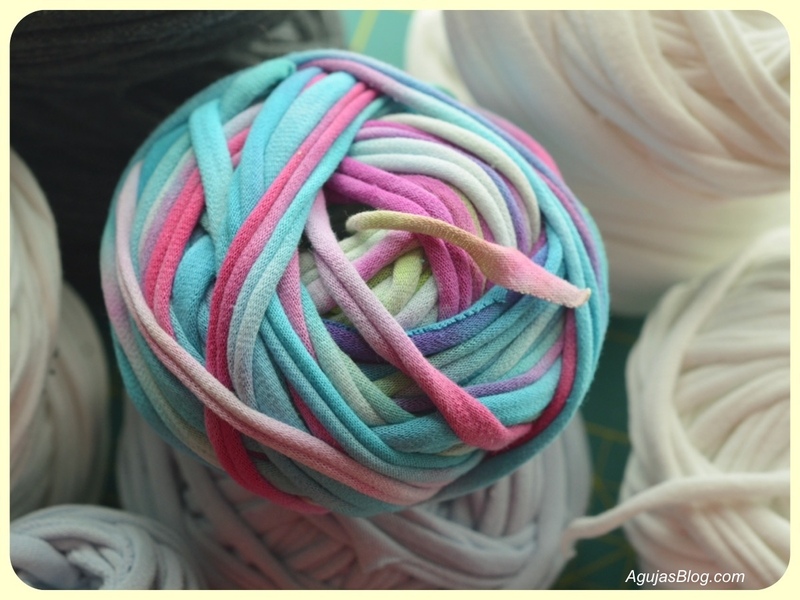 Rather than toss out old t-shirts or convert them to rags, I decided to give t-shirt yarn a try. The white, blue and gray ones are my husband’s old t-shirts. This colorful yarn came from a tie-dye t-shirt my son made in summer camp and never wore. He thought it was pretty cool that I made yarn from it. The plan is to crochet a round cotton throw rug. I don’t have quite enough yarn but I’m getting there. 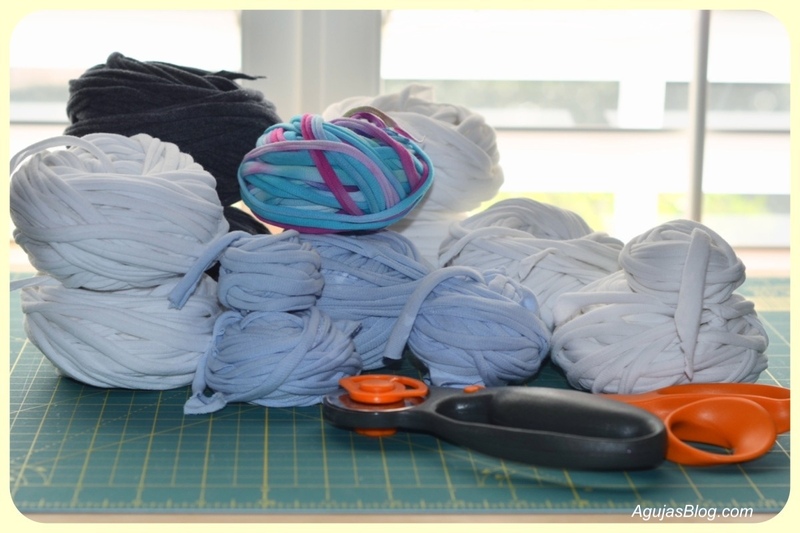 There are many how-to videos on the web for making yarn out of t-shirts. I liked these step-by-step instructions the best from Let Birds Fly. 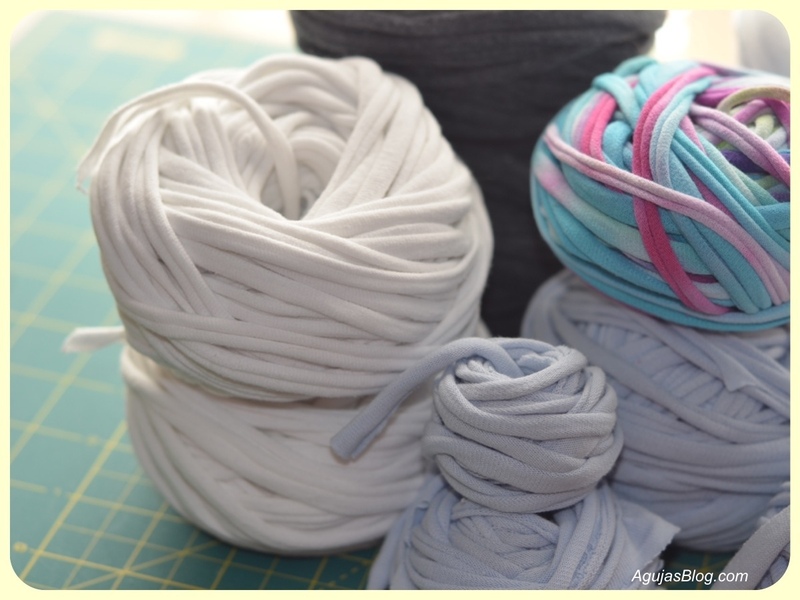 This video tutorial from Knit Picks shows you how to join the ends of t-shirt yarn. Good for you. I make everyone I know pass on their old tea shirts to me – they’re excellent for making rag rugs and what I don’t need I use for rags. Cotton is a high maintenance fibre and shouldn’t be wasted. I need to ask family members too. I have plenty of rags and would like to make something useful and pretty! Husband just cleaned out an old pile of t-shirts from his drawer… Thanks! I learned that t-shirts withOUT side seams work best. The blue shirts had side seams and the yarn comes out with thick sections. Not sure I will use it. I had seen it all over the web and took the opportunity when my husband added a couple to the “what am I going to do with this” pile. It went quickly after following the instructions once or twice. I’ve always wanted to try that. Looks like it’s turning out great. Me too. It was easy once I saw what the instructions were telling me. You get a nice continuous ribbon of yarn cutting the t-shirt that way. I’ve never even thought of doing this before, what a great idea! Well I copied it from others. It is interesting to see the yarn form as you pull on the strip of t-shirt. It will make a great throw rug, like for the bathroom. And I can just toss it in the washer-dryer! Cool. I’m doing the same, but it’s for woven rugs. Ooh, can’t wait to see! That is very cool. I would love to knit and crochet with Tshirts. I’m eager to start but I want to accumulate enough yarn so that I can plan the color scheme. You could dye them to whatever colors you want! All it takes is a cheap tie-dye kit or a package of fiber-reactive dyes. I’ve tie-dyed t-shirt yarn in blue indigo and it makes a really fun knitted fabric. I will be sure to post pics. OMG– was just talking to someone about yoga. I meant to say great idea!! Blame it on spell-check! LOL. It was easier than I thought and fun. Cutting up the t-shirts that way is exactly what I did with plastic bags to recycle them into “plarn” and knitted them into a big loose bag to hold, you guessed it, more plastic bags for recycling. I may have to try that. Seems like it would make a good grocery bag? This is a very intriguing idea! I look forward to seeing how it turns out! Me too! I already asked my brothers to save their old t-shirts for me. Oh this is such a great idea – a rug! A rug you can throw in the washing machine, too. Would be good in a bathroom or a kids’ room. Very cool! Post more pics as it progresses – it’s gonna be cool. I will. Just need some more old t-shirts. very cool. huge environmental hipness factor. looking forward to seeing the results. It’s either going in the boy’s bathroom or ours. I have always wanted to try this! The tie-dyed ball looks wonderful. I loved the way the tie-dye shirt turned out too! It was so easy. It was the first time I tried it. 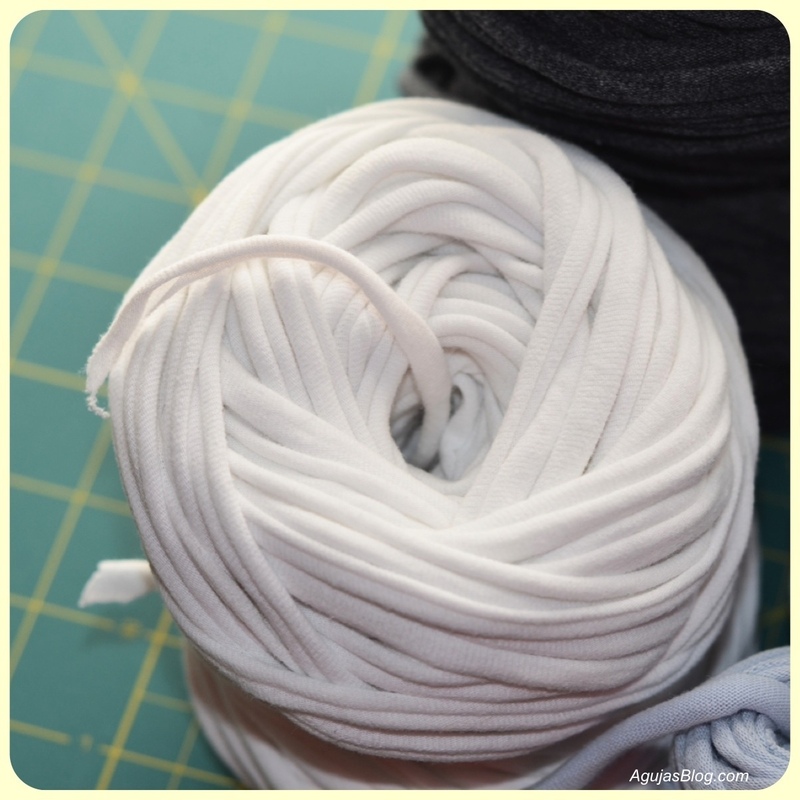 Once you cut the long continuous strips of the t-shirt, you just lightly yank the strips and it magically curls into itself making yarn! It’s great to reuse and make something beautiful. Glad I could pass on this great idea. There are many great videos and blogs with how-to instructions and what has been made from the yarn. I did this in the spring, it was good fun. It will be many many years before I can do another, but if you get overly anxious, goodwill is always an option. I thought of that, buying old t-shirts at garage sales and such. But I think I will get a nice pile from my two large brothers! This is on my never ending list of to-do projects also.. I made a t-shirt stranded neck cowl/scarf thingy this past weekend. Cool. Is it on your blog? I would like to try this soon, I don’t have a lot of T-shirts however. I think I will ping my friends! Do it and then post pics. I want to see what you make!